Moore highlights Watch highlights of Richmond's latest acquisition Andrew Moore. Richmond has signed former Port Adelaide midfielder Andrew Moore as a free agent. 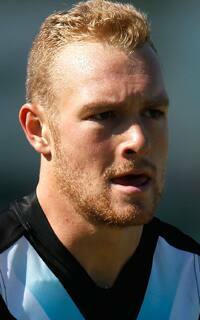 The Tigers secured the services of the strongly-built Moore on a one-year contract. Moore, 189cm and 87kg, played 55 games and kicked 18 goals in a six-year career with the Power, with several injury setbacks along the way hampering his progress there. He had initially been selected by Port Adelaide with its first pick (No. 9 overall) in the 2009 AFL National Draft. The 24-year-old younger brother of former Richmond defender Kelvin Moore is renowned for his clearance and contested ball prowess, and ability to hit the scoreboard. “We’re very pleased to be able to bring Andrew into the Richmond Football Club as a free agent,” said the Tigers’ General Manager of Football, Dan Richardson. “He is a player who has a proven ability to mix it at the highest level, particularly in a contested situation and at stoppages. “At 24 years of age, we feel his football can continue to develop and reach the potential that led to him being a top 10 selection in the 2009 Draft." Moore’s best season at Port was in 2013, when he played 17 games, including the team’s elimination final win against Collingwood and the semi-final loss to Geelong. He averaged 16.4 disposals per game that season and kicked nine goals. This year, Moore managed only five senior appearances, but he was one of Port Adelaide’s most consistent performers at SANFL level. His arrival at Tigerland is the third off-season addition to the playing list since the completion of the 2015 season, along with Jacob Townsend and Chris Yarran.